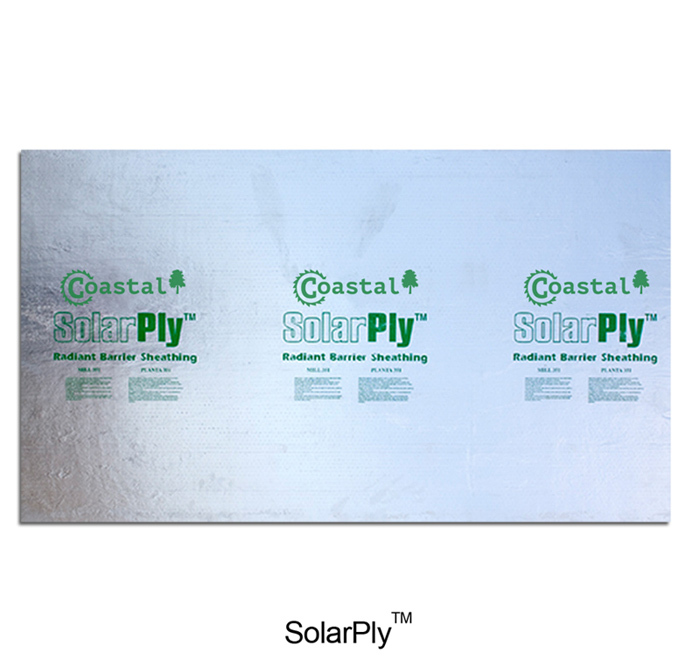 Coastal produces Radiant Barrier Sheathing – SolarPly™ panels as defined in US Product Standard PS2-10 for Construction and Industrial Plywood. Traditional sheathing allows the sun’s radiant heat to enter a home through the roof and walls which can cause extreme attic temperatures, heat transfers, and ultimately higher energy bills. SolarPly™ installs like traditional sheathing but it has a foil coating on one face which reduces up to 97% of the radiant heat transfer from the roof to the attic. This reduction can lower attic temperatures by up to 30 degrees and decrease an A/C system’s work load by up to 20%. Similar to conventional sheathing, SolarPly™ panels are rated for strength properties and are not graded for their appearance since they are generally not exposed in their final use. 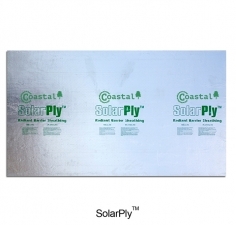 Coastal’s SolarPly™ panels are widely used throughout the industry in the construction of walls and roofs to help homeowners save money. All of Coastal’s SolarPly™ panels are produced with Group 1 species and the glue bond classification is Exposure-1. We offer this item in 15/32, 19/32, & 23/32 Performance Categories. *- Radiant barrier foil may be applied to any grade of plywood.